Home > Rare and Unique, Specimens > Specimen Stocks, Bonds and Documents > Wieboltot Stores, Inc. 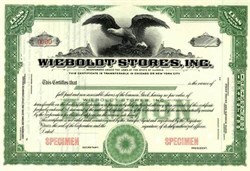 Beautifully engraved SPECIMEN certificate from the Wieboltot Stores, Inc. This historic document was printed by the Republic Banknote Company and has an ornate border around it with a vignette of an eagle. During the early twentieth century, German-American retailer W.A. Wieboldt built one of Chicago's largest and most famous retailing chains. From a small storefront shop on North Avenue, Wieboldt gradually expanded his operations, first by opening small department store on Milwaukee Avenue in 1884 and later by establishing a chain of neighborhood-oriented department stores that challenged the dominance of the Loop as the city's retailing center. By the end of the 1930s, there were six Wieboldt stores in operation across the city. Known for their good values, unpretentious merchandise, and multilingual sales staff, the stores were especially popular among ethnic, working-class shoppers who could not afford or did not like to shop at the big downtown department stores.